When you have sold gift vouchers you may wish to look up the details of the voucher for a client such as the remaining balance or expiry date. Doing this is very easy. 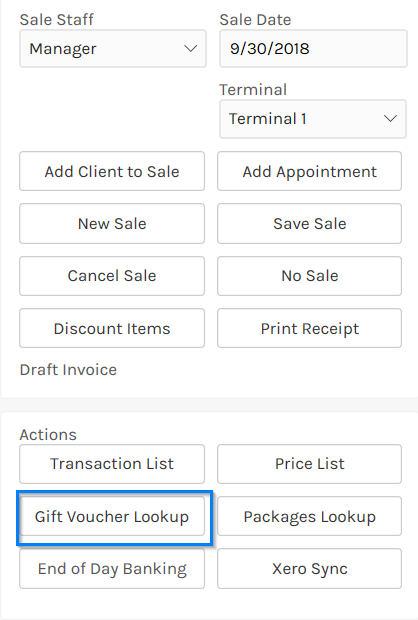 Go to the Sales screen and click on the Gift Voucher Lookup function. This will display the voucher lookup screen. Enter the Gift Voucher Code as printed in the voucher or code ino the field. The details of the voucher will then be automatically displayed on the screen, you may also re-print the Voucher if need be. If the Gift Voucher cannot be found a message will be displayed telling you so and you may wish to look at the Gift Voucher Sales report to track it down as possibly an incorrect code was entered.